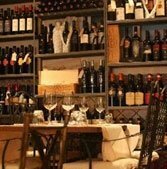 Ad Hoc occupies a capable place in Rome’s ever-growing wine-centric, novelle cuisine niche. The elegant Via di Ripetta location inside a 15th century building (between Piazza di Spagna and Piazza del Popolo) is literally steeped in wine — with stuffed wall racks competing with clocks and Rome prints. The menu in turn is fairly typical of “new” Rome experimentation (“An explosion of pleasure for the senses,” goes the PR). There’s an asparagus carbonara (interesting) and carbonara “al cubo,” which gives you the classic take and two variations, with black mushrooms and porcini. Centerpiece dishes included Ossbuco with saffron rice cake (Ossobuco con tortino di riso allo zafferano), fried Sicilian small squid with courgettes or duck leg browned with black truffle. The exceptionally delicate antipasto “Degustazione” gives you aged “Don Raimundo” Spanish ham, a selection of cheese and mustard, Danish cured carpaccio, and “crostini” with Colonnata lard. In general, the “degustazione” approach ensures a many-flavored take on otherwise tried and true formulas, with tailored wines to match. The result is delicious, costly, and mostly unconnected to the straight-arrow Rome trattoria style. 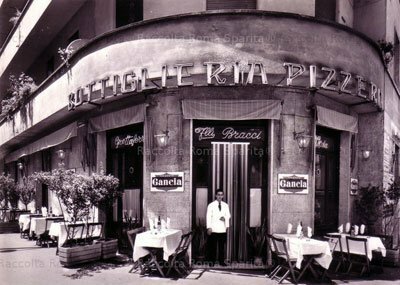 So if you’re looking for New York or L.A.-style dining in Rome (vanilla mousse for dessert), this is a place whose pretenses you’ll appreciate, admire and even revel in (expect €40-60 a head minimum, depending on your appetite and wine choice).